to "drb", who left comments on my last two posts, telling me my unidentified bug could be a fruit fly. That was my first suspicion, but I've never seen a fruit fly. drb also left a website address and the phone number for the fruit fly hotline. Thank You, I couldn't find that number in my phone book. I turned off the computer and called the number, got an email address, and sent them the three photos I had taken to confirm (or deny) that what I had was in fact a QLD fruit fly. The images on the website are drawings rather than photos, so it's hard to be sure. It's definitely not a Mediterranean (spelling?) fruit fly as those are black and speckled, according to the drawings. But it does look like a QLD fruit fly. Then I got a screwtop jar and went outside to catch that bugger! He's inside the jar next to my computer now. For this weeks Sunday Selections, I've chosen an old wishing well that I found at Hahndorf, here in SA. That's South Australia, not South Africa or South America. I was wandering my way to the bus stop since it was time to start heading home, when I saw this from across the road. Naturally, I crossed over to have a closer look. Was it a functioning well? Did it have water in it? Did people throw coins in to make a wish? No. No. Long gone. No. 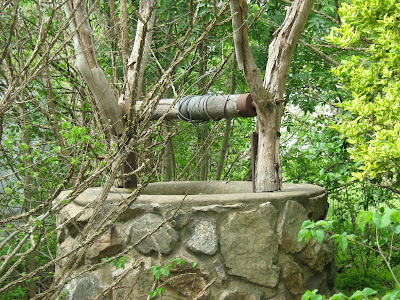 Set in an overgrown block next to a house, the well has a steel cable for winding up a non-existent bucket. The winding handle is also missing. I assume in older times this would have been a sturdy rope. I was disappointed to find no water in the bottom, not even a few inches covered by a grid, for people to throw wishing coins into. Instead the bottom is filled in with dirt and a couple of rocks. There's also a broken ring of some kind of metal, rusty, but not too eaten away. 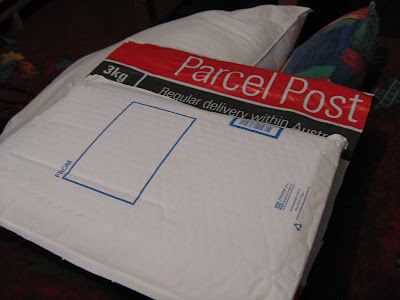 When I checked my mailbox yesterday afternoon, I found this parcel. I didn't recognise the sender or the return address, but it was addressed to me, so I opened it. And found these. Two boxes of Be Natural snack bars. Then I remembered entering a giveaway review done by Jodie from Lightening. I'd completely forgotten that these were coming my way. Here's a closer look, so you can read on the packet what is in them. I've tried one of the currant/berry ones and found it to be yummy and chewy. Soft enough for my poor old teeth to bite into too. I don't like the harder snack bars that almost need a chainsaw to get through. I'm looking forward to trying one of the coconut/apricot ones tomorrow. Earlier this morning, I went out to hunt for caterpillars, but didn't find any. I did find that two of my capsicum buds were now flowers. They're so tiny, about a cm across. I was outside earlier, watering the garden, and noticed lots more flowers on the mini rockmelons. After putting away the hose, I went back for another look. Plenty of male flowers, a few female flowers. Since the previous females had yellowed and dropped, I didn't want to take the chance that these new ones had maybe been pollinated by bees or ants, so I got my tiniest paintbrush and twirled it inside a couple of the male flowers, collecting the faintest smudge of pollen on the tip, then twirled that inside a female flower. I repeated this for all the female flowers I could see. They're easy enough to spot, the petals are larger and paler than the males. Did you all know that those tiny hairs on the stems and leaves prickle and sting? I didn't, but I do now. I hope I've done the right thing with the flowers. I'll know soon enough if the fruit starts developing. I've done a little more decluttering. A hobby of mine is to search magazines and newspapers for home plans that I like. I've always got my eye out for a good floorplan. Something that suits me down to the ground. I used to attend open inspections just to get a copy of the floorplan. I don't do that anymore, now I can look at them on the internet. Just look at what they're doing to my plants! I go out twice a day and pick off as many of the tiny little buggers as I can find. Here's one I missed because it wasn't on any of the vegetables. See how he's the same colour as the leaves he's eating? That's why the tiny ones are so hard to spot. Here he is on the palm of my hand. Big bugger isn't he? Then I "accidentally" dropped him and "accidentally" stepped on him. 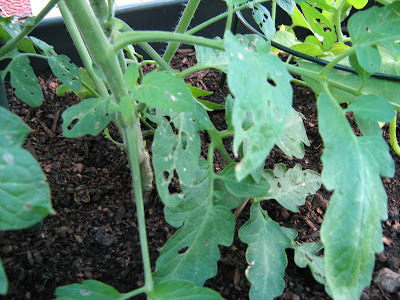 In spite of the caterpillars, they plants are beginning to produce fruit. This pile of yellow is pumpkin pollen that I've been collecting via a paint brush ready to brush onto any female flowers that might decide to appear. There was one female flower, but it was the only flower open and the males didn't appear until the female flower had died off. Now there are about 6 flowers, all male. Pfft!! Apparently my shoulder exercises are causing me pain because my back muscles have become tight and stiff through lack of use. Also my neck is very stiff and sore, similar to whiplash stiff and sore. So my doctor has recommended physio on top of the exercises. I immediately went across the waiting room to the physio's office and made some appointments. They're all in the same building, these doctors, the physio and the dentist too. Only the orthopaedic surgeon is a bus trip away in the city. Well, so far I've had two physio treatments. After the first one a heat pad was put on my neck and back to help the muscles relax. I relaxed so much I almost dozed off. This latest treatment was a little more painful. Okay, a lot more painful. With no soothing heat pad after. Pressure is put on the trigger points, (whatever they are), and also on the tight areas where tendons and muscles don't stretch the way they should. Or something. Oh no! whatever will I do? The background to this little tale can be summed up in one sentence. I have bad teeth. Very bad teeth. Okay, so it's two sentences. No need to get picky. On the other hand, I do tend to get a little picky myself, so go ahead. Pick. I've inherited my mother's teeth. Largish, squareish, straight, but with very thin enamelanda tendency to root canal abcesses. From the age of 17, I have spent many hours in dentists chairs. Chairs which are clearly not built for someone only five feet tall. I have also spent countless dollars on fillings and root canal work. With the result that now my teeth are about 95% filling and 5% actual tooth. Root canal work means that the tooth is now dead and becomes quite badly discoloured. Something I've lived with for many, many years. Because caps or crowns aren't cheap. So veneers were the way to go. I rearranged my budget and put away a small amount each week. They are finishing the Oprah Aussie shows by singing "I still Call Australia Home". I'm bawling my eyes out. I love that song and I love my country. Sunday Selections was thought of by Kim, from Frogpondsrock. To participate, select a few photos from your files,that have not yet been seen anywhere on your blog, post them under the Sunday Selections title, then head on over to Kim's and add your name to the linky list. This week's theme at Drifting Through Life, is "Waiting". 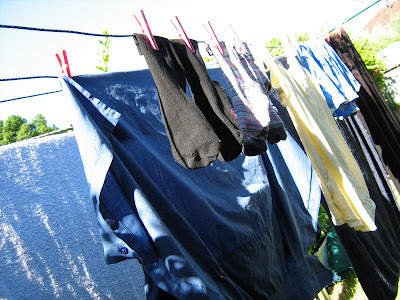 Waiting for the washing to dry. Waiting for a friend. Go ahead, hunt up some dusty old photos, and link up with Sunday Selections. Not running for a bus. Not running to or from something or somewhere. Not running in fear of my life. Not chasing something or someone. In my dream, I was walking through Rundle Mall, Adelaide, when I suddenly started running. Just because I love to run. In the dream, that is. In real life, I don't run. As I was running, I morphed into my much younger self. My body thinned, my arthritis disappeared, and strangely, my clothes changed and I was suddenly wearing white shorts and a white t-shirt. In my dream, I could feel the breeze on my face caused by the running. I could feel my joints, my limbs and muscles working as they used to. I could feel the smoothness, the ease, the flexibility. I could feel the easy breathing. There was no gasping or shortness of breath, so the asthma was gone too. I could feel that I was really enjoying the running. I wanted to run forever. At the same time, I knew that I was dreaming. After several weeks of eating storebought yoghurt, I decided it was time to start making my own again. It isn't hard, I've just been lazy. But taking a look inside my purse and wondering just where the heck all that money has gone, well, that was the deciding factor. A small tub of yoghurt was costing me almost $3. 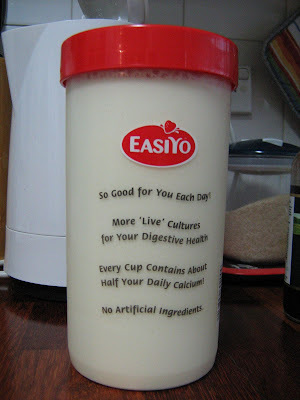 Making my own is a similar cost, but one packet of EasiYo Greek Style yoghurt base makes a whole kilo of yoghurt. So it's much more economical. I got out the EasiYo maker, half filled the yoghurt jar (it's plastic) with water, added the powder, mixed thoroughly, then topped up the container with more water. Screwed on the lid, shook vigorously, then stood it in the yoghurt maker thingy (which I forgot to take a photo of), which had been filled to the proper level with boiling water. Put the lid on that and leave it to stand overnight. Next morning, I had a 1 kilo jar of yoghurt. Ready to put in the fridge to chill while I was at work. Oprah....I'm more interested than I thought I'd be. 15 minutes later, several of them are sitting down while still waiting, and singing Christmas carols!! 26 minutes....and here comes the helicopter again! Everyone is waving at it while someone in the chopper takes the photo. The aerial views are amazing!! Like many others, I scoffed a little at the news that Oprah was, finally, coming to Australia. I laughed at the news that she was bringing several American audience members with her. I was heard to say, Why? Does she think we don't have enough people over here to fill her audience seats? I have many blogs on my reading list and I'd love to get around to all of you every day. But just lately, for at least a week now, maybe a bit longer, I'm having trouble with my internet connection. I'm online, reading away, when suddenly my connection is cut off. just like that, I'm staring at a black screen. I press the power button to turn off the computer, leave it a minute, then start it up again and try to reconnect. Most nights? Nothing. Not even a dial tone. Tonight, after trying to reconnect, I used the start menu to shut down properly. As soon as it shut down, my computer turned itself on again. What's going on here?? It didn't dial a connection automatically like it is supposed to, I went through the start menu and dialled a connection that way. So here I am back online. For how long? Who knows? This overly-bright-taken-with-flash image was taken when I first received this handy dandy little item as a Mother's Day gift almost two years ago. Made in similar fashion to those giant beanbags that people flop into, this mini beanbag is for books. Only for small novels though, as it's about 22cm high by 26cm wide. I spotted this cute little beanbag in Dymocks when I was there once with my daughter. I exclaimed over it and she asked what colour I'd prefer if she was to buy me one for a gift. I opted for red, since most of my bedroom is red in various shades. 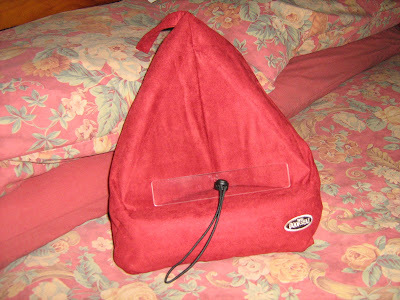 It has a little drawstring thingy which can be loosened and tightened easily to fit your book and for when turning pages. This is the small plastic holder that rests against the book and holds the pages open, so handy when both hands are otherwise occupied. You know, with typing on your blog, or eating dinner, or holding a hot chocolate when you're propped up in bed on a cool early early morning. I'd like a few suggestions please. Next March, just a few weeks away now, I'll be flying in to Sydney for the Bloggers Conference. I'll be arriving on the morning of Friday the 18th and finding my way to the hotel, hopefully via an airport shuttle service. Then I'll have time to wander around a bit, maybe meet a few of you who are already there? Then there'll be dinner, etc. Saturday is the Conference, a whole day. The dinner-dance after? I don't have a ticket for that, so I'll get dinner in another place, then go to my room and make notes of what I've seen, heard, learned. Sunday, however, is another whole day that I have to fill. So what does one do in Sydney on a Sunday? but there'll be a little after I've paid for meals etc. I'll have my camera with me and a supply of batteries, plus an extra memory card. So help me out here? online supermarket shopping? I'll pass. Because browsing the aisles for yourself means you spot new stuff. spring onions and half a carrot. Only half? I'd better buy more carrots. I cooked a little rice, about half a cup, and stirfried the vegetables. 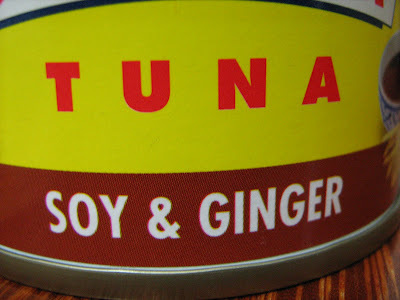 Then I tossed the tuna and ginger, (drained of the oil in which it had been packed), in with the stirfry. Look at all the ginger shreds! By this time the rice was cooked, so I drained it, added it to the stirfried veg, then added an extrateaspoon or so of soy sauce, since there didn't appear to be much in the can, probably just a little to flavour the oil, which I had drained off. I'm a littleexcited. Just a little. Maybe a little more than that. Oh heck! I'm doing backflips here! After I posted about the beehive last Saturday, January 15th, I emailed the local council and also the local free newspaper, The Messenger. You know, in case they'd be interested in a local story of something not normally seen on a roundabout at an intersection. I said they could use the article and the photos if they wished. As it turns out, they are interested. A nice lady named Jane phoned me this morning and asked if I'd like to have my photo taken at the beehive site so they could feature me along with the story. We had a nice little chat, then decided to take a photo of me this afternoon, at 2pm, standing by the bees, with my camera. Well, I raced into the shower and washed my hair........because I can't appear in the paper with messy hair now, can I? Welcome to Sunday Selections part two. For this week's selection, I've chosen "things I use everyday". These photos were taken when I'd just learnt how to set the macro lens. I went a bit nuts going all over the house taking close-ups of every damn thing that caught my eye. 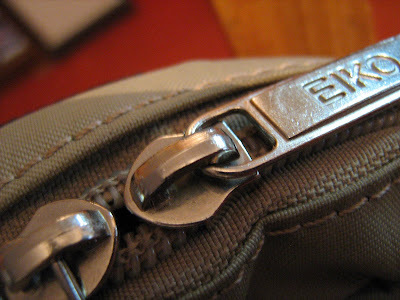 Zippers on my handbag. This particular handbag has six of them. Pen. All day long. Taking notes, jotting things down, making lists. Clock. I glance at this to see how late the TV programs are running. They're almost never on time. I-Pod. If I don't hear at least a little music everyday I go a little crazy. Mostly I listen while walking to and from work. Veggie peeler. I love my veggies. Phone. Gotta stay in touch. Forks. So handy, for beating eggs, mashing pumpkin, stabbing food to bring it to my mouth. You won't believe what I saw! 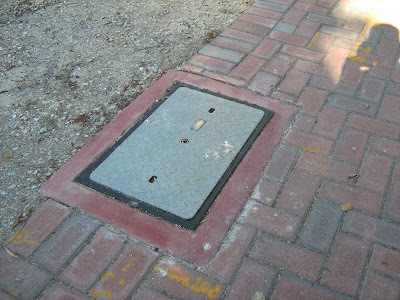 We've all seen access lids like this on streets, footpaths, roundabouts, right? Well, here's one in a roundabout. It's a water meter box. Can you see that the lid is off the box? Here's an even closer look. Can you see there's something inside the box? Many, many, bees. Building honeycomb. Two strips, one down each side of the box. Yes, I did get up close, bees don't scare me and I'm not allergic. But I was slow, calm and careful, because there's so many bees and taking unnecessary risks is silly. Getting this close is probably classed as a risk, but the bees seemed to be ignoring me and I was using the zoom lens. I did try for a macro shot, but couldn't get close enough without bees flying around my face, so I backed off a bit.